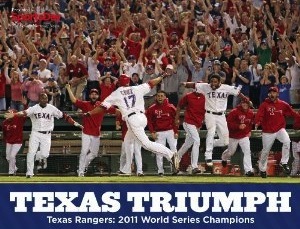 Head to Amazon For Your Texas Rangers 2011 Champions Book! For the low low price of $29.95 you can “pre-order” your copy of “Texas Triumph”, the inspiring full-color photo book that details the incridible 2011 season of the Texas Rangers from spring training up to their incredible World Series win in game six..err…game seven…oh wait. Embarrassing! Get the book that captures the Rangers World Series championship season, brought to you by SportsDay from The Dallas Morning News. This incredible 11 x 8.5 hard-bound book takes you from the first pitch on Opening Day to the final out of the 2011 World Series in 144 dramatic pages. It sounds dramatic! Especially that twist ending. We hear M. Night Shyamalan is in talks to direct the movie version. With user-submitted tags like “oopsthatneverhappened” and “epicfail” this book sure seems like a page turner! Update: …and it’s gone! Amazon just took the page down. Screenshots below.